Near-Earth asteroids (NEAs) are those that come within 1.3 Astronomical Units of the Sun, and therefore have the ability to also come within range of the Earth. The International Astronomical Union�s Minor Planet Center is in charge of keeping data on all such objects. Because asteroids 1 kilometre across and larger would devastate the planet if one were to impact Earth, all such objects are being sought after by programs such as NEOWISE, LINEAR, and NEAT. Astronomers believe they have discovered more than 90 percent of the large NEAs. Of the approximately 900 known near-Earth asteroids 1 kilometre or larger, only about a tenth of them are classified as Potentially Hazardous Asteroids (PHAs or Potentially Hazardous Objects, PHOs). But PHOs do not have to be as large as 1 kilometre across, those are simply the ones that would wipe out life on Earth. PHOs start with a diameter of about 150 metres and up (because asteroids of this size could still cause widespread devastation), and they must be able to come within 0.05 AU of Earth. While most of the 1-kilometre-class asteroids are believed to have been found, only about 20 to 30 percent of 150-metre-class and up asteroids have been located and are being tracked. At last check there were currently more than 1300 PHAs. The asteroid Apophis has garnered a fair amount of attention in the past as an object that could potentially strike Earth and cause major destruction. At 320 metres across, Apophis would raise tsunamis if it hit water or devastate an area the size of Texas if it hit land. But since it was discovered in 2004, recalculations of its orbit with new data have put it safely out of reach. On 9 January 2013, Apophis passes a generous 14 million kilometres away from Earth. By comparison, the Moon is on average about 384,000 kilometres away. Apophis�s 2013 pass poses no threat to life on Earth and allows astronomers to refine its future orbits. Current estimates put Apophis�s next pass, on Friday, 13 April 2029, at around 40,000 kilometres away. It still is not predicted to collide with Earth, but it will come soberingly close, as it passes much nearer to Earth than the Moon and comes within range of Earth�s geosynchronous satellites. But 2029 seems like a fairly long time to wait for such a close approach. However, in the very near future, another asteroid is predicted to get just as close to Earth as Apophis�s 2029 pass, and it is scheduled to do so in February 2013. Asteroid 2012 DA14 will pass about 40,000 kilometres from Earth at its closest approach at around 19:30 UT on 15 February 2013. But at only 45 metres across, asteroid 2012 DA14 is small and not considered a PHO. Discovered in early 2012, this new asteroid would still wreak havoc on any localized area it struck. Fortunately, it is not expected to make contact with Earth. To state the obvious, the largest asteroids are easier to find and have therefore mostly been discovered already and are being tracked. 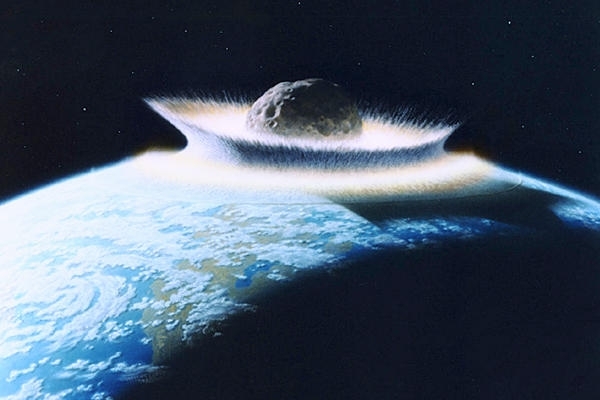 There are no large asteroids known to be on a collision course with Earth. For a fairly realistic mock-up of what that would be like, see this video. Many smaller asteroids that come close to Earth are not found until days and hours before their close approach because they are just too small to be spotted before then. Fortunately these small rocks would not cause much damage if they hit Earth; in fact most would probably entirely disintegrate in the atmosphere and do nothing more than provide us with a good show. For example, an asteroid named 2011 CQ1 passed within 5471 kilometres of Earth on 4 February 2011. But at only 1.3 metres wide, it would have burned up entirely before it reached land. On May 28 and 29, two tiny asteroids zipped by just above Earth, one of which had been discovered about a week in advance and the other for only hours before its closest pass. Fireballs that occasionally and unexpectedly brighten the sky may be similar to these tiny asteroids that were detected but merely came close and did not interact with Earth�s atmosphere. In 1972, an event now known as the Great Daylight Fireball was captured on film and video as a rock estimated at about 14 metres wide passed just 57 kilometres above Earth�s surface. Scientists now have much of Earth�s neighbourhood mapped out with most potentially damaging objects being tracked and the smaller, less threatening objects slowly being revealed as well. Perhaps soon one of these small harmless objects will be discovered to be on a collision course with Earth and will allow us advanced notice of the light show it will provide before fragmenting and safely burning up above our heads.